The Network Element Layer, which encompasses the industry’s broadest portfolio of devices, applicationspecific integrated circuits (ASICs), and Cisco IOS® Software across routing, switching, and mobility and provides programmatic access to the entire network through APIs. The Network Control Layer , which abstracts away network infrastructure elements from network applications and provides automated provisioning and policy control. The Network Application Layer, which consists of network-aware applications, developed by Cisco and third parties, that communicate with network infrastructure and services through the Network Control Layer in real time. 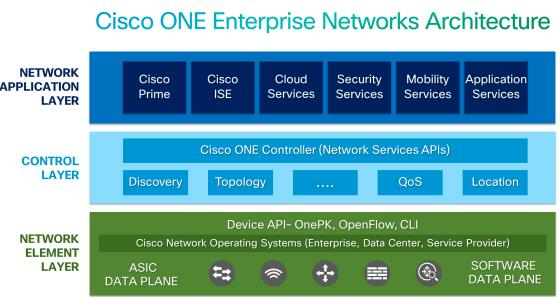 The combined capabilities of the Network, Control, and Application Layers of the Cisco ONE Enterprise Networks Architecture provide several important benefits. They unlock unprecedented innovation and simplify your network operations, while protecting your network investments. With the ability to interact with network elements and The Network Control Layer using open network APIs, detailed network information becomes available to Cisco and third-party developers to create innovative network applications. This unlocks a world of possibilities to employ rich, detailed, real-time information about the network infrastructure to optimize services, gain valuable analytics, and support new business models. The Cisco ONE Enterprise Networks Architecture simplifies provisioning and configuration, reduces complexity and risk, and makes it much faster and easier to provision or change network services. Even as you take advantage of the new generation of Cisco network solutions and new Cisco APIs, you can continue to use the network infrastructure you have in place today. In addition to supporting Cisco onePK API to enable new specific Cisco capabilities, the Network Control Layer also supports standardized OpenFlow and CLI, so it can communicate and interact with your installed Cisco equipment.